I am currently listening to this and Paradise Lost. I got this for free, and who does not like free stuff right? If i were to tell you which one is easier to listen to it would easily be Paradise Lost. Rarely have I ever listened to such boring ramblings, most of whom enter into platitudes and banal events that are seemingly told for no reason at all except in order to reach a page-count so that the novel can be published. It is not that I don't enjoy novels with this kind of style. I very much enjoyed The Martian for example. This book, however, is simply not enjoyable, funny, or enlightning in any way shape or form.I usually try to look for the positive qualities of a novel, but sadly it has no redeeming qualities whatsoever. This review is featured on my blog: Writerly Bookish StuffI rate this book 3.5/5.Bill is an advisor to his MP friend, Jennifer. A broken leg has him confined to his apartment during a zombie infection outbreak. Jen promised to get him to safety, but the car that was sent was attacked and the driver was killed. Bill's story is built upon the journals of his confinement from just before the London evacuation to about 3 months after.The first part of the book is pretty much Bill moaning, moping, and waiting to be rescued. His poor survival skills and the insights into how he passes the time were building blocks to show his mind set and how it changes with the realisation that he is well and truly left to his own devices. He isn't a man who takes well to manual work, and you quickly learn that he isn't courageous, but he is intelligent and knows a lot about the evacuation, the early days of the outbreak, and what has/ may have gone wrong during the evacuation and containment.Persevere through the first part, and I promise, the book picks up.The author has thought out different government tactics during such an incident, and I found it all extremely fascinating. I cannot fault the detail woven into the evacuation plans and the realism this creates.There is something different about this book, and it's hard to put my finger on. Considering that I didn't really like Bill and the narrative isn't action based, I found myself turning the pages and wanting to know the conclusion. Whether it was the realism, his intellect, or the need to see if boring Bill toughened up and survived, I am hopeful for the next books in the series. Eh this one was OK. My Thoughts: Have you ever read a book that when you finished you just felt like, "Huh, that's it?" That was my reaction after finishing London (Surviving the Evacuation). The main protagonist Bill is an incredibly dull fellow who spends the first half of the story giving us commentary about his even duller existence. Listen, I like a good build up but when over half the story follows just a single character sitting in his flat complaining about everything from lack of hot tea to the weather it can drag the story down quite a bit. Bill is the type of protagonist who shouldn't survive but somehow does despite doing literally everything wrong. Now I will say that despite the first half being nothing more than a lesson in procrastination the story wasn't all bad. Once we left the flat and Bill started exploring the newly dead world things started looking up. The back half has more action and the pacing picks up considerably. So in the end while I didn't love this one, I know I'll at least, well probably anyway, still continue on with this series. In the end I gave this one ★★★. I enjoyed this book a lot. It starts off a little slowly, with the rather mundane tasks of having to survive the zombie apocalypse with a broken leg (as if it wasn't hard enough already!) but there's already the hint of intrigue as we discover the main character was involved in politics, and has a lot of behind the scenes information. Unfortunately he's been left behind to fend for himself, and we follow his journey through his personal journal as he tries to make his way out of an over-run London and to discover what went wrong with the evacuation plan - a plan that he himself designed, but never got to see in full. It is a fairly short and easy read, and ideal for fans of zombies, survival or the apocalypse, with just enough political / conspiracy to give it a different edge to the usual. This was a promotional free purchase, but I have already bought book 2 and look forward to reading it. Wow. This is everything you need in a zombie novel. I've read a fair few of the zombie diary style books, this one is by far my favourite. It's really well written, and it's relatable, Bill acts exactly like the average person would (or hopes they would.) With just enough contact with Zombies to keep you on your toes, and plenty of new survival ideas, it really does keep the readers interest.What makes this different is Bill used to work closely with the government, and ends up with a broken leg so can't escape to evacuate (thank goodness) He seems a bit of a helpless tool at first, but as time progresses he really comes into his own.I found this full of new ideas (for me anyway, and I love zombies) although mixed with some of the classic zombie traits. I've taken some ideas on board, just incase we do get over run with Zombies. And I'm now eagerly awaiting book two! There’s a lot to be really impressed by here. I say that as a man who doesn’t generally read zombie novels, who thinks that we’re over-saturated by the undead and that most of the depictions aren’t that interesting. But, if you spin that on its head, then I suppose the fact there is so much zombie media out there means some of it is going to be good. It's the law of averages.The first half of this novel is fantastic. If you too are tired of zombies, I’d still recommend the first half. It’s basically an injured man trapped in a flat watching the world fall apart outside. It doesn’t really matter that it is zombies, it could be Cthulhu sending its tentacles down every street. The horror comes from his being trapped and helpless, in a big city but cut off from the rest of the world. It’s gripping, claustrophobic (which is obviouslya type of horror I love) and the scares come from the practicality of having nothing and having no way to get anything.Once our protagonist gets out of the flat, it’s not quite as interesting (even if this is a book which visits my old stamping grounds of Surrey Quays and New Cross). Still, the fact that it remains self-consciously Robinson Crusoe with added zombies makes it a winner in my eyes. A smart and entertaining read that that takes an intriguing conceit and keeps finding new ways to make it thrill. 3.5Better than your run of the mill zombie book.The excellent audio narration helped. Even though I have never watched the show, this reminds me of the last man on Earth. He is doing anything to survive and we are the voyageurs cheering him on. This was my first time reading anything by the author and would love to continue the series. Complicated bookReminds me of old school end of the world tales like Day of The Triffids. The narrator is annoying at first but by the end you find yourself liking him. Also not the hyper competent protagonist of a less well thought out tale. Just read this in the space of 24 hours - it's not a very long novel, only just over long novella length, I think, or that might be just because I was enjoying it so much that I read it quickly; maybe it seemed shorter than it was.This is the journal of Bill Wright, the man who was unlucky enough to break his leg just as the trouble started. The first half of the book is taken up with his survival, hope and growing despair as he recuperates in his flat, the second half with his escape and attempt to find a place in which he can be safe and live some sort of life again. Alongside all the day to day worries, though, he uncovers to the reader (and to himself) the real truth behind the outbreak and the 'evacuations'... suffice to say I downloaded the next straight away and will start reading it as soon as I have posted this review! I'm fascinated by tales about survival against all odds, and think Frank Tayell has done a marvellous job of this. It's a lot more intelligent and well written than many books in this genre that I've started and abandoned, and the pace of the first part is spot on. I found the intricate details of Bill's ideas for day to day survival completely engrossing, and a round of applause for not just copying half the scenarios from The Walking Dead, 28 Days Later or Survivors; this actually paints a slightly different picture of such a disaster, and not one in which the protagonist keeps coming across groups of people who just happen to have all the skills necessary to survive in the new world, either. Loved the conspiracy orientated bits, and I can't wait to read the truth about Lenham Hill.....I'd definitely recommend this to any fans of this genre - and it's set in England, too! First, I would like to send a huge ‘thank you’ to Frank Tayell for gifting me a copy of his book. Secondly, wow… The writing was practically flawless, quick and easy to read. No hiccups. I truly did enjoy reading this one. I won’t go into the overview, because let’s face it, you can read the overview with the book. What I do want to point out is that this is the first zombie book I’ve read with such an extreme personal point of view, I can’t help but think of ‘Bill’s’ character as being me and the thoughts I would have during the end of time. Should I leave my safe haven? How long can I stay and survive here? The constant struggle back and forth on whether to walk down those stairs, open that door, and face what’s out there was nerve racking enough but then you must also scavenge the buildings around (which I will admit some of those ventures were quite comical). What I’ve realized most zombie books appear to have a group mentality, several people fighting together and telling their personal stories half-heartedly as they chop away bodies. Not this one (ok, so there is some chopping). Here is one person, one journal keeping the man sane, one hope that she will come save him, and one realization that it may never happen. So what is he to do? Survive or die? And with a broken leg…Oye. Even the Doomsday Preppers didn’t have a chance in this book. This will go on my zombie favorite’s list for sure! Bravo Mr. Frank Tayell! Looking forward to Book 2! Bill is a political advisor for rising star MP Jennifer so she promises to evacuate him to a safe place is the zombie apocalypse in the US enters the UK. Bill is at home with a broken leg when Britain becomes infected and the first car that comes for him is attacked, leaving the driver as zombie nosh, and Bill stuck.Bill is a very annoying man. He is sitting safe indoors with food that Jennifer brought early in the outbreak, and he is just moaning like a child. He has no real milk as Jennifer failed to bring him that and biscuits, only the powdered stuff he doesn't like, his tea is cold, he can't get up and down stairs easily because of his broken leg, Jennifer is taking AGES to send another car...and when he realises that one of his tenants who fled because of the zombies repainted her room without permission, he is gleeful about keeping her deposit. WTF is wrong with this idiot?Bill is dumb. He owns a house where he rented out rooms on the ground and first floor as flats while he lives in the attic. His tenants fled and left most things behind so why not move down into one of these flats instead of moaning about going up and down the stairs to raid their stuff??? Show some common sense man or just shut up with the complaining already!!! I can't imagine why Jennifer would WANT to rescue this whining child! I'd leave him there to rot. This had a slow start, but once Bill left his flat, it moved steadily, and of course the world's governments were involved. One thing has me confused: does it take a bite to cause the infection? Those in the church committed suicide but didn't turn. The two in the Grange Farm Estate died from the useless vaccine, but when Bill entered the cottage, they didn't open their eyes and come at him. In The Walking Dead, it doesn't matter if you're bitten or not: no matter how you die, you'll come back as a Walker. Makes me wonder. I hope Bill's able to recharge the laptop's battery and watch the rest of the videos, although I don't know how much good it will do.I also wonder if Jen made it, and Sholto.As I said before, it all boils down to kill the dead, fear the living.I may skip ahead and read the last book. This was... boring. The last 1/3 of it was actually interesting. But most of the book was basically the main (and only) character sitting there and complaining. I think that the story will be better in the next book, which is the only reason I finished this one in the first place.The writing here is okay. I've seen some mistakes, but nothing too bad, and they were very few. It's a journal, which can be good sometimes. In this case, it was meh. The MC was not interesting enough to be the ONLY thing in the book. The story needs other people, or else we'll be stuck with this whiny guy forever... and he cannot carry a whole series on his own.All in all, this had the potential to be pretty good. But it wasn't. Surviving The Evacuation by Frank Tayell tells the story of Bartholomew Wright, nicknamed Bill by most people living in London. What Bill does throughout the course of this book reveal through journal writing about his life and the events taking place during the zombie apocalypse happening.For the most part I enjoyed reading this, it's written pretty well, and took just a little while for me to read this due to its short length. Four stars and I look forward to reading part two. This novel is mostly about a man with a broken leg sitting in his flat feeling sorry for himself and whining. Occasionally he looks out of the window at any zombies that might be milling about outside. Eventually he leaves and wanders around London, encountering the odd zombie. Most of the time he finds other places to sit in and feel sorry for himself and whine. There are a few embellishments, but that's about it. It's more about surviving the tedium than the evacuation. 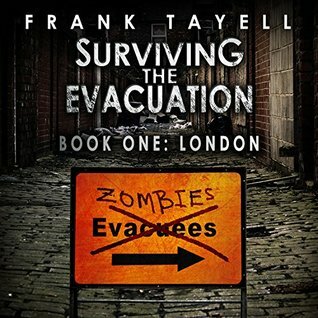 An excellent story by Frank Tayell that is well-executed and well-written.Bill is stuck in his apartment as the zombie virus breaks out across London with a broken leg. A lot of the book is an account of his diaries as he monitors what's happening to the U.K by radio or outside his window. There were a few unbelievable scenes, but then I had to remind myself this is a zombie book!Definitely a good book and highly recommended. Looking forward to the next book Frank Tayell! It's pretty rare that a book will catch me up so entirely that I go and snap up the whole series as soon as I can. These books are engaging and show a very popular story arc in a new way. its a series I don't want to see end! I started off really disliking the main character. But I suppose the average person would be the same as him in that situation. He had to find himself and his strength. He was more tolerable by the end of this book. I'm going to love this series. I really like the " journal stories". A must read. Could not finish. Just dull. See http://www.abookdevourer.blogspot.com or http://abookdevourer.booklikes.com for review. Interesting format.. like a diary. Gives a more personal and immediate feel to the story. To shorthand the story concept...If I had to compare this story to others, I'd say its "28 days later" meets "the man who watched the world end" (by Chris Dietzel.. excellent book btw). The author captures perfectly the feeling of isolation, of fear and helplessness..he's trapped, fully knowing "what" needs to be done but having no way to achieve it through circumstances beyond his control. This is not a traditional post apocalypse survival story, with a protagonist prepped to the hilt and ready for anything. There are no surprising revelations of all kinds of stunningly useful survival skills. Or convenient discoveries of hidden stashes of incredibly useful supplies or information. No, this was just a regular guy, trying to figure things out as he went along (without the aid of google and no "call a friend"options either).I almost cheered when he suddenly realized how useful a wok could be! Because he's totally alone, the introduction of other characters is limited, mostly, to flashbacks from his past. But these flashbacks serve to explain how he came to be in this predicament and the evacuation process that London went through. The pace was slow, occasionally. Understandable, really.. after all, how much "action" could there be under the circumstances and with no input or interaction from other people either. But I did get frustrated with him, he was intelligent but made some stupid decisions. I wanted him to ration his food better and some of the things he did were so wasteful. But of course, for a long time, he was expecting a rescue team and thought all he had to do was survive until they arrived. ETA: one thing made me crazy though, why on earth didn't he wait for his neighbor in the downstairs apartment! He had more than enough time to get all his gear down there, with a few days supplies, just in case. Then all he had to do was lay low and quiet till the neighbor showed up, and then it would have been just two minutes from door to car. Ugh. What an idiot.I appreciate that the mystery of the outbreak is explained... how it all really began, (horrifyingly possible - why do scientists search for a one size fits all solution. Always a mistake!). We find out why he was left behind and seemingly forgotten (his educated guesses on that were fairly accurate). I also liked his final choice for a safe haven. A smart choice, made from hard lessons learned. Finally, he was thinking like a true a survivalist.This was a free download that turned out to be rather good. Recommended! In a crowded market place it can be difficult to differentiate 'your' Zombie Apocalypse novel from the multitude of others. In some it is the virus/infection and how it affects the victims - are they fast/slow, do they evolve, are they even dead. In others it is about the survivors - what skill sets do they bring to the party. Are they special forces or law enforcement or just doomsday preppers fully equipped and armed to take on the zombie horde. Zombie Apocalypse novels are more likely to be set where weapons and deadly technology is more accessible. As such, a zombie apocalypse in the UK would see us more likely reaching for a cricket bat than a sub machine gun or flamethrower. There are good exceptions to this but there are certainly fewer examples as maybe we don't offer the deadly toy-box that many like to revel in in this sub-genre.In this book, Frank Tayell gives us a somewhat dull, not particularly suited to the times protagonist. More of an every man. He puts that man in the unusual position of, initially at least, of being a bystander or observer to the apocalypse as he is laid up with a broken leg essentially watch the world crumble through the windows of his flat. In fact his early efforts at dealing with his situation are laughably poor and immensely frustrating. He is in affect putting us, normal everyday UK residents into the ZA - How bill copes (or doesn't) is probably how we we would do in a similar situation.As the story evolves though it's clear that Bill does knows perhaps more than we would in that situation, through his work and contacts he has more information and is perhaps even somehow complicit in the conspiracy which we begin to find out more about by the end of this book. He even becomes a bit more adept a surviving which removes some of the frustration i felt in the earlier parts of the story.This is a quick read, well enough written to be engaging and has revealed enough to make the central conspiracy compelling enough for me to follow Bill for a while longer on his journey. An interesting read. STE, book 1: London is an anomaly in the indie zombie apocalypse universe. Not a lot of action here. It's one guy's introspective telling, in which he does a lifetime worth of thinking as he moves from one abandoned place to another, trying to hunker down and survive the outbreak. Many, many authors would fail to execute that premise, but Tayell handles it nicely- the book is very well written and the reader comes to admire the hero's craft and guile as he learns to survive in a land overrun with the dead. Another interesting split from the genre's usual fare- firearms barely make an appearance in STE. There's a pistol the hero is unable to retrieve off the floorboard of a car, and that's it until the very end of the book, when he finds a policeman's suicide note. I found that refreshing, since the zompoc genre certainly has its share of gunporn. A sad number of books in the genre seem to be nothing more than an author's adolescent fantasy of what a gun-toting, zombie-shooting, Billy Badass he'd be if only he were lucky enough for an outbreak to occur. Compared to those protagonists, one who chooses to mostly avoid the dead and has only the items around him to use as a weapon when forced into a confrontation is a breath of fresh air.